The weekend really passes too fast. Luckily today is a public holiday here in Singapore. We are celebrating Hari Raya Haji and have the Monday off. The boys are enjoying their sleepover at their grandparents house and Tiger girl and I are having some peace and quiet at home. This week I am sharing a Japanese Song by the group FT island. I love the tune and the lead singer is real eye candy. 1. Are you excited for the holidays or are you dreading them? I am excited as we are going to Bali. It will be the first time that the kids and I visited the place. 2. Do you hit the snooze button or get right up? I get right up. I would like to snooze for an extra few minutes but with the baby up it’s impossible. Yes. They are still intact. 4. What was the last piece of candy that you ate? Gummy bears which Doggie boy brought back from his Sunday school party. 5. Do you shop at thrift stores? I do if there is time and if they do carry the stuff which I need. Thanks again for playing along with us, and I love your video & I totally agree – YUM! Great eye candy! Wow! Eye Candy on a Monday! Have a lovely vacation! and I still have my tonsils too. Love the photo of you girls! Stopping by from Meet Me on Monday and Monday’s Music Makes Me Move! 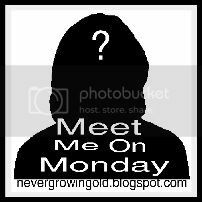 I am visiting from Meet me on Monday…I already follow so just stopping by to say hello and catch up! Just look at that scrumptuous baby face! Ahh I miss those baby days. I would LOVE to visit Bali! Have fun for me too! Lovely photo of you both! I like the song! TFS! Bali sounds like a great holiday destination!! wow, perfect blond. 🙂 he has a very nice voice too.